We are a south-east Queensland based animal rescue dedicated to the rescue, rehabilitation and re-homing of dogs and cats in genuine need. Fresh Start Rescue Incorporated includes a team of dedicated and passionate volunteers who are committed to putting the animals first! Our members come from all different backgrounds of animal welfare, rescue, training and enrichment. We are based in Brisbane, Queensland. Every effort is made to match our cats and dogs with their perfect family and home, and all vet work is included in the adoption fee. We consider that the measure of our success in doing so can only be judged once our animals are happy and healthy and in suitable forever homes. 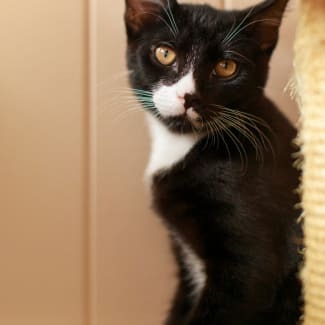 Toby is a gorgeous boy whose markings are striking and resemble a tuxedo, just like James Bond. He is a little shy and is working hard on trusting the human kind again, so he sometimes prefers to watch at a distance until he feels safe to come close. Toby is the only boy amongst three sisters, so he is super patient. The cat tower and tunnel is his favourite place and he enjoys the various toys, joining in many fun games with his sisters. He enjoys snuggling with his sisters where he feels safe and happy. He is inquisitive, watches everything going on and enjoys investigating everything. He has come leaps and bounds from the timid baby he was when he came into our care. He really enjoys when he hears that bag rustling for dinner time! Toby is a quiet achiever and enjoys being close when he feels safe. Coco has a beautiful fluffy and soft exterior with cheeky caramel eyebrows which enhance her very cute looks. She loves the cat tunnel and looking through the window at the world going by outside from the cat tower. She is happy to play with her siblings and is very inquisitive as to what is going on within the home. She enjoys snuggling up to her siblings for a kitten nap. She enjoys throwing and chasing the balls with bells around and also anything you have on the end of a stick. She is a socialite and enjoys keeping an eye on what is happening in the room. She enjoys food and is still learning to trust the gentle hands of human touch, but she is always happy to see you and enjoys showing you just how fun she can be. 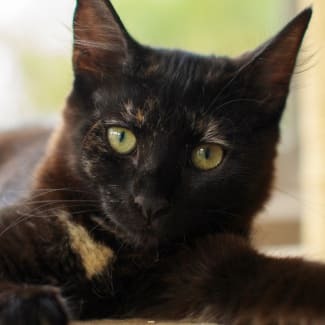 Bella enjoys life and loves the toys and will play with pure kitten happiness for hours! She then enjoys laying in the cat tower bed and watching the world outside, while she falls asleep kitten dreaming. She enjoys watching television and playing many games. She is fearless and she likes to see the world from above. She is fun, enjoys a challenge and makes you laugh with her zest for life and play. She loves watching what you are doing and likes to be involved. Bella loves to hide in the cat tunnel and loves back pats while she shows her appreciation in purrs. She is super inquisitive and is interested in what you are up to and enjoys just having a look and checking it out for you. She is a happy kitten girl and enjoys when you serve her food up - she is very appreciative! She will lie next to you when you lay down to sleep after she has had a play and will sing a purring song to send you to sleep. She is intelligent and enjoys kitten life to the fullest. 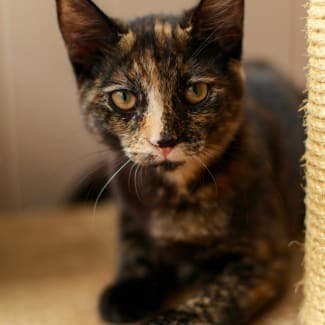 Grace has bright kitten eyes and a personality to match that will melt your heart. She may be small but she has a purr that shows her appreciation for you scratching under her chin and giving her tummy rubs. She gives you ankle rubs and meows when it is time for food and enjoys kitten cuisine. She loves playing kitten games with the toys, balls, tunnel and the cat tower. She enjoys snuggling and purring to sleep while basking in the sun and watching the world go by through the window. She is inquisitive and loves climbing inside the tunnel and the kitten box where she curls up and enjoys a kitten nap. Grace is very sweet and will win many hearts. She is kind, gentle and enjoys just being close to you and knowing all is good and safe. Like an artist’s work, Grace's markings are pure perfection. Grace has a lot of love to give and loves to be around you and to feel safe and loved. She is happy, kind and loves to be involved in life just like any kitten would. 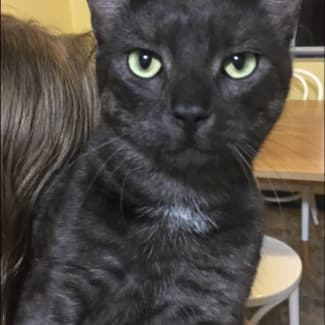 Hi there, I'm Panther (but my foster family calls me Oscar) - you can name me whatever you like. I'm a chilled out cat who loves nothing more than to sleep the day away as you can see in my photos. I also love a pat and chin rub and will start purring when you cuddle me. I'm a handsome cat, mostly black with unique markings on my chest and tummy. I'd be a great companion who would love to snuggle up on the couch with you. My foster family's house has lots of cats and dogs and kids and I'm fine with all of them, but I'd be equally as happy being the only cat with just adults around. 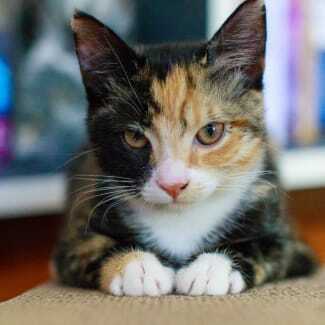 I'd suit anyone who is looking for a cat to love. I hope to meet you soon.